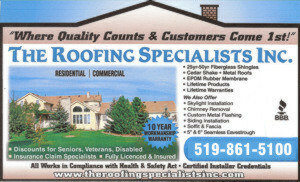 When I realized it was time to get my roof done I started by getting quotes from 4 companies. Throughout my research I was pleased with the service and sample options I received from the team at the Roofing Specialist. During my research I watched many houses in my neighborhood have shingles delivered and left on the roof and a disposal bin in their driveway for days without activity. I quickly realized it was important to have my roof done in a timely manner and without a mess. I’m pleased to say I made the right decision to have the Roofing Specialist replace my roof in a timely manner and was pleasantly surprised to learn they also recycle the shingles. I have since recommended this company to other friends who have also been pleased. This is completely unsolicited. The Roofing Specialists did an amazing job making our heritage home look like the beauty she was in 1884! From quote to clean-up, Dan and Matt’s crew worked like a well-oiled machine without any issues or concerns. The end result – a splendid new roof robust for the next 40 years! We highly recommend them! Your company was excellent to deal with right from quote, through the work and the invoicing. Quoting was detailed, documented and discussed very well. The job itself was completed upon the agreed time despite challenging weather. The crew was courteous and professional and cleaned after themselves thoroughly each of the work days. The details of the job were completed with high quality with longevity in mind, and the quality of materials was superior also. After the work was done, a formal invoice was delivered with signature & reference to the payment – another important detail. Overall, I think your company and crew are doing this work the way the industry should. My wife and I feel we got every penny’s worth of security and peace of mind for our home by working with you. It is for that reason we have also filed a compliment report with the Better Business Bureau with a nomination for their annual award process. The roof looks wonderful. I have to thank the guys for not stepping all over my plants in the garden, it must have been a challenge on its own. They did a great job with the clean up. I wasn’t here to see them working, but Birnie said they were very fast, professional and courteous. Thanks for the wonderful job. Thank you for a great job. Sure going to hand your cards out. Your crew is very special to deal with. I wish you all the best in your business. Just a fast note to let you know that Dan and his company have completed our new roof. It looks great! I have to tell you that these guys were fast, thorough, and totally professional. Tremendous teamwork. They cleaned up beautifully afterward. I was mainly concerned about the adjacent properties, but they made sure there was no problem. One of my neighbours said he had never seen anything quite like it. It is obvious why you employ his company in your line of work. We really appreciate your sending them our way. Thank you, and thank you. Thank you for such a wonderful job the guys did. I was so impressed with the workmanship and the care that went into the job. They were polite and absolutely charming to talk to. I would be more than happy to give a reference. I will also continue to tell people of the great service we received. Thank you for doing a very professional job replacing the roof on our cottage. Pleasant to work with, completed the job in a professional and timely manner. I was very impressed with the quality of service and workmanship. Thank you again for your help in fixing our chimney leak. Your prompt replies have been much appreciated and we would be happy to provide you with a reference to future customers. I wish to thank you for your services in fixing the leak in our roof at 115 King Street, Burford. There have been two hard rains with no leaks being apparent, so it appears the problem has been fixed.